, earl of Orrery, fifth son of Richard earl of Cork, was born April 25, 1621, and created baron Broghill in the kingdom of Ireland when but seven years old. He was educated at the college of Dublin, and about the year 1636, sent with his elder brother lord Kinalmeaky to make the tour of France and Italy. Afterhis return he married lady Margaret Howard, sister to the earl of Suffolk. During the rebellion in Ireland, he commanded a troop of horse in the forces raised by his father, and on many occasions gave proofs of conduct and courage. After the cessation of arms, which was concluded in 1643, he came over to England, and so represented to the king the Irish papists, that his majesty was convinced they never meant to keep the cessation, and therefore sent a commission to lord Inchiquin, president of Munster, to prosecute the rebels. 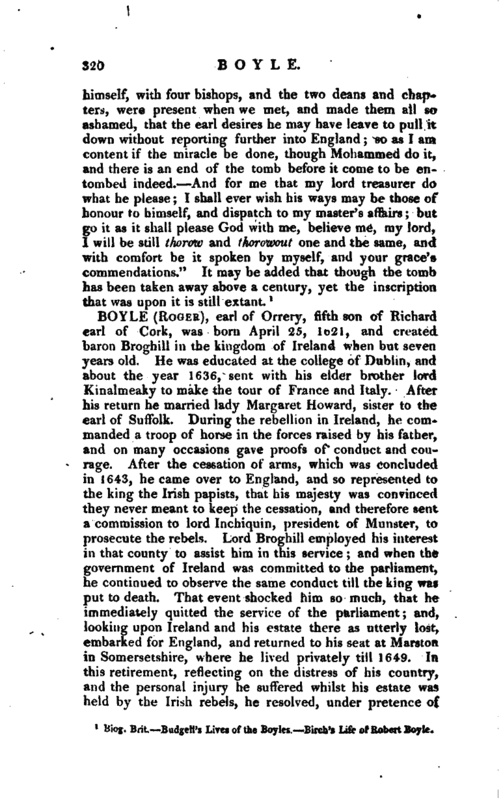 Lord Broghill employed his interest in that county to assist him in this service; and when the government of Ireland was committed to the parliament, he continued to observe the same conduct till the king was put to death. That event shocked him so much, that he immediately quitted the service of the parliament; and, looking upon Ireland and his estate there as utterly lost, embarked for England, and returned to his seat at Marston in Somersetshire, where he lived privately till 1649. In this retirement, reflecting on the distress of his country, and the personal injury he suffered whilst his estate was held by the Irish rebels, he resolved, under pretence of | going to the Spa for his health, to cross the seas, and apply to king Charles II. for a commission to raise forces in Ireland, in order to restore his majesty, and recover his own estate. He desired the earl of Warwick, who had an interest in the prevailing party, to procure a licence for him to go to the Spa. He pretended to the earl, that his sole view was the recovery of his health; but, to some of his friends of the royal party, in whom he thought he could confide, he discovered hi* real design; and having raised a considerable sum of money, came to London to prosecute his voyage. The committee of state, who spared no pains to get proper intelligence, being soon informed of his whole design, determined to proceed against him with the utmost severity. Cromwell, at that time general of the parliament’s forces, and a member of the committee, was no stranger to lord Broghill’s merit; and considering that this young nobleman might be of great use to him in reducing Ireland, he earnestly entreated the committee, that he might have leave to talk with him, and endeavour to gain him, before they proceeded to extremities. Having, with great difficulty, obtained this permission, he immediately dispatched a gentleman to lord Broghill, to let him know that he intended to wait upon him. Broghill was surprised at this message, having never had the least acquaintance with Cromwell, and therefore desired the gentleman to let the general know that he would wait upon his excellency. But while he was expecting the return of the messenger, Cromwell entered the room; and, after mutual civilities, told him in few words, that the committee of state were apprised of his design of going over, and applying to Charles Stuart for a commission to raise forces in Ireland; and that they had determined to make an example of him, if he had not diverted them from that resolution. The lord Broghill interrupted him, and assured him that the intelligence which the committee had received was false; that he was neither in a capacity, nor had any inclination, to raise disturbances in Ireland; and concluded with entreating his excellency to have a kinder opinion of him. Cromwell, instead of making any reply, drew some papers out of. his pocket, which were the copies of several letters sent by lord Broghill to those persons in whom he most confided, and put them into his hands. Broghill, finding it was to no purpose to dissemble any longer, asked his excellency’s pardon for what he had said, returned him, Vol. VI. y | his humble thanks for his protection against the committee, and entreated his advice how he ought to behave in so delicate a conjuncture. 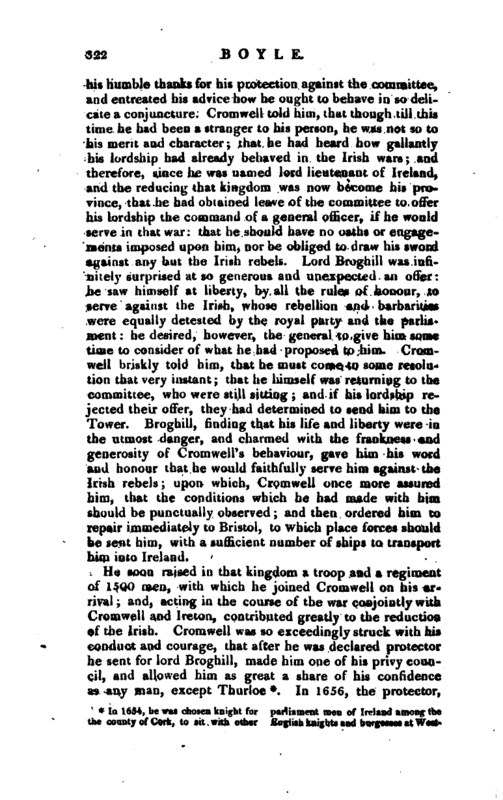 Cromwell told him, that though till this time he had been a stranger to his person, he was not so to his merit and character; that he had heard how gallantly his lordship had already behaved in the Irish wars; and therefore, since he was named lord lieutenant of Ireland, and the reducing that kingdom was now become his province, that he had obtained leave of the committee to offer his lordship the command of a general officer, if he would serve in that war: that he should have no oaths or engagements imposed upon him, nor be obliged to draw his sword against any but the Irish rebels. 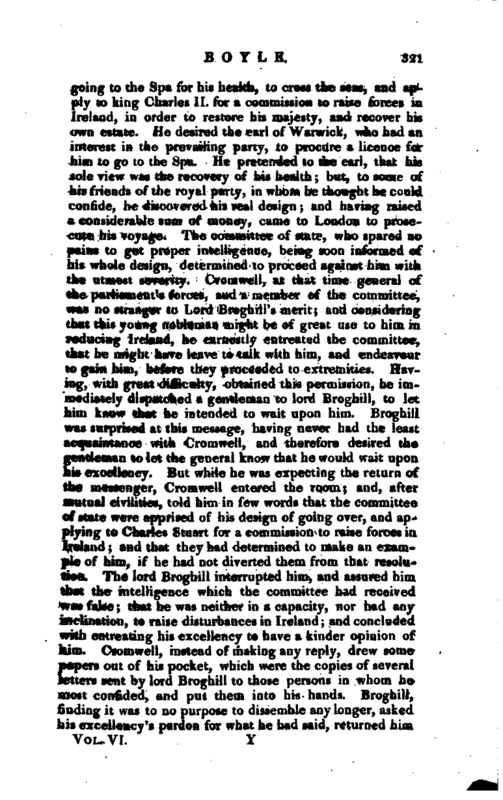 Lord Broghill was infinitely surprised at so generous and unexpected an offer: he saw himself at liberty, by all the rules of honour, to serve against the Irish, whose rebellion and barbarities were equally detested by the royal party and the parliament: he desired, however, the general to give him some time to consider of what he had proposed to him. Cromwell briskly told him, that he must come to some resolution that very instant; that he himself was returning to the committee, who were still sitting; and if his lordship rejected their offer, they had determined to send him to the Tower. Broghill,‘ rinding that his life and liberty were in the utmost danger, and charmed with the frankness and generosity of Cromwell’s behaviour, gave him his word and honour, that he would faithfully serve him against the Irish rebels; upon which, Cromwell once more assured him, that the conditions which he had made with him should be punctually observed; and then ordered him to repair immediately to Bristol, to which place forces should be sent him, with a sufficient number of ships to transport him into Ireland. minster. He was likewise appointed one of the protector’s council in Scotland, which was worth to him 1474l. per annum. And in 1636, he was not only chosen parliameui man for Edinburgh, but ku^Ut for the county of Cork in another parliament; which met at Westminster the same year. He was likewise made one of the protector’s lords, and a member of the other house. Borlase’s History of the Reduetion of Ireland. Budgell. In 1656, the protector, | either suspecting Monk’s attachment to his person, or desirous of relieving the people of Scotland, who complained of this man’s severity, proposed to lord Broghill to go to that kingdom with an absolute authority; to which his lordship consented, upon condition that he should have a discretionary power to act as he should see proper; that no credit should be given to any complaints, till he had an opportunity of vindicating himself; and that he should be recalled in a year. Cromwell kept his word to him; for though the complaints against Broghill were more numerous than those against Monk, upon giving, at his return to London when the year was expired, an account of the reasons of his conduct, Cromwell conceived a higher esteem for him than ever. After the death of Cromwell, Broghill did his utmost to serve his son, to whom his lordship, in conjunction with lord Howard and some others, made an offer, that if he would not be wanting to himself, and give them a sufficient authority to act under him, they would either force his enemies to obey him, or cut them off. Richard, startled at this proposal, answered in a consternation, that he thanked them for their friendship, but that he neither had done, nor would do, any person any harm; and that rather than that a drop of blood should be spilt on his account, he would lay down that greatness which was a burden to him. He was so fixed in his resolution, that whatever the lords could say was not capable of making him alter it; and they found it to no purpose to keep a man in power who would do nothing for himself. 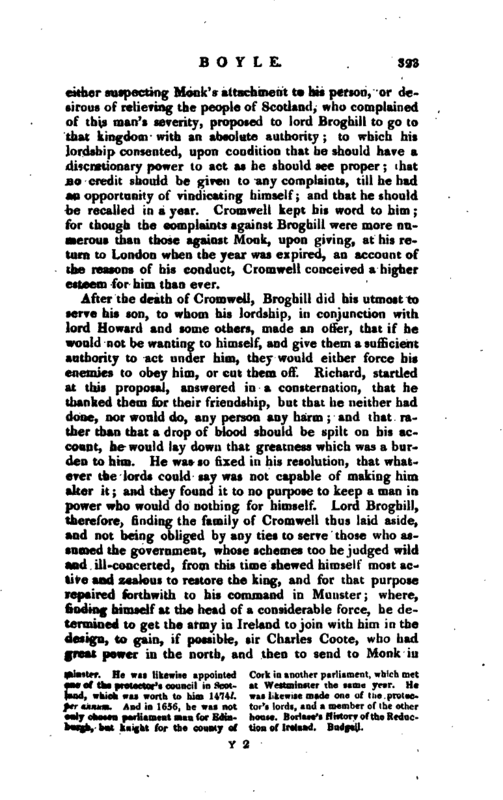 Lord Broghill, therefore, finding the family of Cromwell thus laid aside, and not being obliged by any ties to serve those who assumed the government, whose schemes too he judged wild and ill-concerted, from this time shewed himself most active and zealous to restore the king, and for that purpose repaired forthwith to his command in Munster; where, finding himself at the head of a considerable force, he determined to get the army in Ireland to join with him in the design, to gain, if possible, sir Charles Coote, who had great power in the north, and then to send to Monk in | Scotland. Whilst meditating this design, a summons came to him from the seven commissioners, sent over by the committee of safety to take care of the affairs of Ireland, requiring him to attend them immediately at the castle of Dublin. His friends advised him to be upon his guard, and not put himself in the power of his enemies; but, as he thought himself not strong enough yet to take such a step, he resolved to obey the summons. Taking, therefore, his own troop with him as a guard, he set out for Dublin. When he came to the city, leaving his troop in the suburbs, he acquainted the commissioners, that, in obedience to their commands, he was come to know their farther pleasure. Next day, on appearing before them, they told him, that the state was apprehensive he would practise against their government, and that therefore they had orders to confine him, unless he would give sufficient security for his peaceable behaviour. He desired to know what security they expected. They told him, that since he had a great interest in Munster, they only desired him to engage, on the forfeiture of his life and estate, that there should be no commotion in that province. He now plainly perceived the snare which was laid for him; and that, if he entered into such an engagement, his enemies themselves might raise some commotions in Munster. He saw himself, however, in their power, and made no manner of doubt but that if he refused to give them the security they demanded, they would immediately put him up in prison. He therefore desired some time to consider of their proposal; but was told, they could give him no time, and expected his immediate answer. Finding himself thus closely pressed, he humbly desired to be satisfied in one point, namely, whether they intended to put the whole power of Munster into his hands? if they did, he said, he was ready to enter into the engagement they demanded; but if they did not, he must appeal to all the world how cruel and unreasonable it was, to expect he should answer for the behaviour of people over whom he had no command. The commissioners found themselves so much embarrassed by this question, that they ordered him to withdraw; and fell into a warm debate in what manner to proceed with him. At last Steel, one of the commissioners, who was also lord chancellor of Ireland, declared himself afraid, that even the honest party in Ireland would think it rery hard to see a man thrown into prison, who had dons | such signal services to the Protestants; but that, on the other hand, he could never consent to the increase of lord Broghill’s power, which the state was apprehensive might one day be employed against them. He therefore proposed that things should stand as they did at present; that his lordship should be sent back to his command in Munster in a good humour, and be suffered at least to continue there till they received further instructions from England. 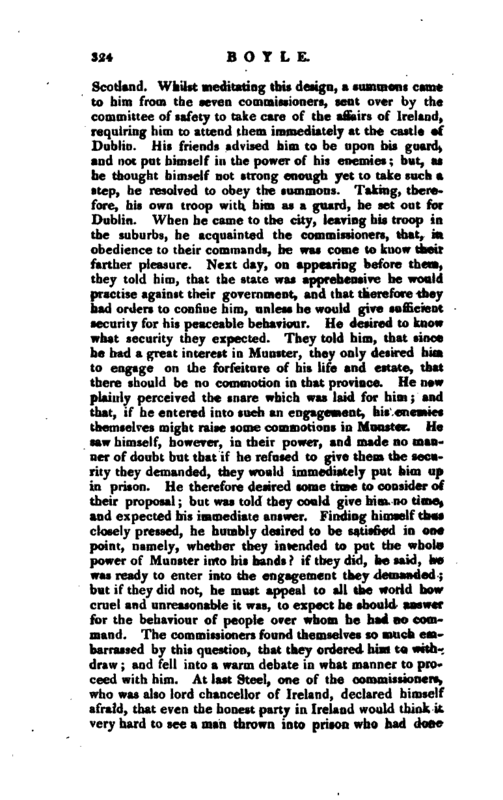 This proposal was agreed to by the majority of the board, and lord Broghill being called in, was told in the most obliging manner, that the board was so sensible of the gallant actions he had performed in the Irish wars, and had so high an opinion of his honour, that they would depend upon that alone for his peaceable behaviour. Upon his return to Munster, he applied himself as closely as ever to form a party for the king’s restoration. After making sure of his own officers, the first person of weight he engaged in the design was colonel Wilson, governor of Limerick, in which place there was a garrison of 2000 men; and having now secured all Munster, he sent a trusty agent to sir Charles Coote, to persuade that gentleman to do in the north of Ireland, what he himself had done in the south. Sir Charles, who had taken disgust at the superiority of lieutenant-general Ludlow, and the parliament’s commissioners, and thought his eminent services not sufficiently rewarded by the presidency of Connaught, came readily into the design. 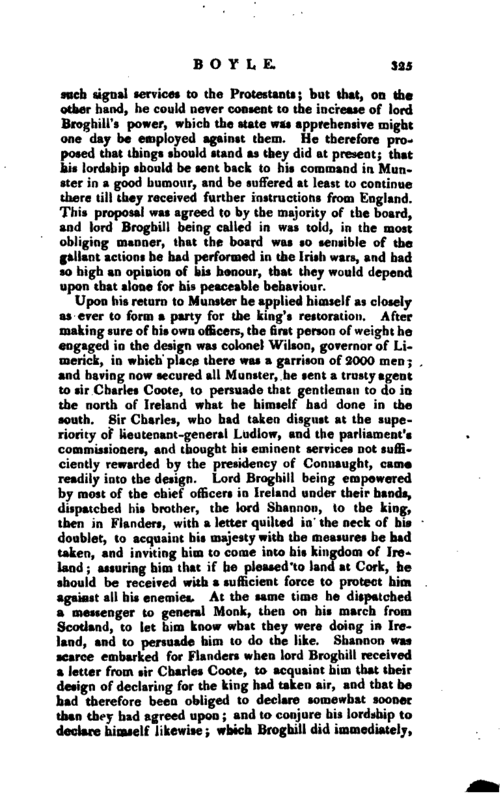 Lord Broghill being empowered by most of the chief officers in Ireland under their hands, dispatched his brother, the lord Shannon, to the king, then in Flanders, with a letter quilted in the neck of his doublet, to acquaint his majesty with the measures he had taken, and inviting him to come into his kingdom of Ireland; assuring him that if he pleased to land at Cork, he should be received with a sufficient force to protect him against all his enemies. At the same time he dispatched a messenger to general Monk, then on his march from Scotland, to let him know what they were doing in Ireland, and to persuade him to do the like. Shannon was scarce embarked for Flanders, when lord Broghill received a letter from sir Charles Coote, to acquaint him that their design of declaring for the king had taken air, and that he had therefore been obliged to declare somewhat sooner than they had agreed upon; and to conjure his lordship to declare himself likewise; which Broghill did immediately. | that he might not desert his friend, though he was a little apprehensive that sir Charles’s precipitancy might ruin their design. By this means those who had assumed the government of Ireland, finding themselves in the midst of two powerful parties, made little or no resistance; and lord Broghill and sir Charles Coote secured that kingdom for his majesty. 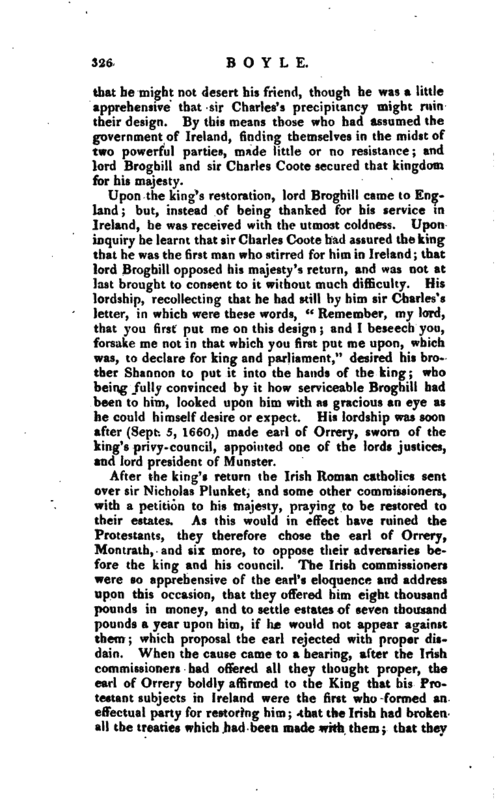 Upon the king’s restoration, lord Broghill came to England; but, instead of being thanked for his service in Ireland, he was received with the utmost coldness. Upon inquiry, he learnt that sir Charles Coote had assured the king that he was the first man who stirred for him in Ireland; that lord Broghill opposed his majesty’s return, and was not at last brought to consent to it without much difficulty. His lordship, recollecting that he had still by him sir Charles’s letter, in which were these words, “Remember, my lord, that you first put rne on this design; and 1 beseech you, forsake me not in that which you first put me upon, which was, to declare for king and parliament,” desired his brother Shannon to put it into the hands of the king; who being fully convinced by it how serviceable Broghill had been to him, looked upon him with as gracious an eye as he could himself desire or expect. His lordship was soon after (Sept. 5, 1660 V) made earl of Orrery, sworn of the king’s privy- council, appointed one of the lords justices, and lord president of Munster. After the king’s return the Irish Roman catholics sent over sir Nicholas Plunket, and some other commissioners, with a petition to his majesty, praying to be restored to their estates. As this would in effect have ruined the Protestants, they therefore chose the earl of Orrery, Montrath, and six more, to oppose theif adversaries before the king and his council. 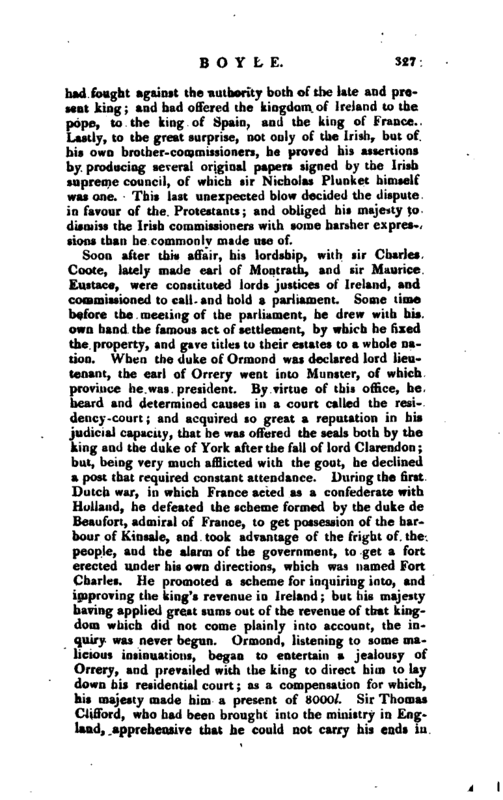 The Irish commissioners were so apprehensive of the earl’s eloquence and address upon this occasion, that they offered him eight thousand pounds in money, and to settle estates of seven thousand pounds a year upon him, if he would not appear against them; which proposal the earl rejected with proper disdain. When the cause came to a hearing, after the Irish commissioners had offered all they thought proper, the earl of Orrery boldly affirmed to the king that his Protestant subjects in Ireland were the first who formed an effectual party for restoring him; that the Irish had broken all the treaties which had been made with them; that they | had fought against the authority both of the late and present king; and had offered the kingdom of Ireland to the pope, to the king of Spain, and the king of France. 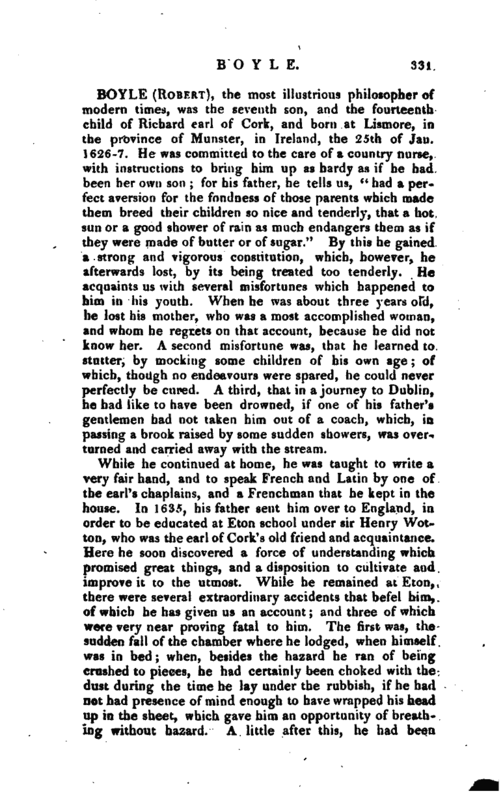 Lastly, to the great surprise, not only of the Irish, but of his own brother-commissioners, he proved his assertions by producing several original papers signed by the Irish supreme council, of which sir Nicholas Plunket himself was one. 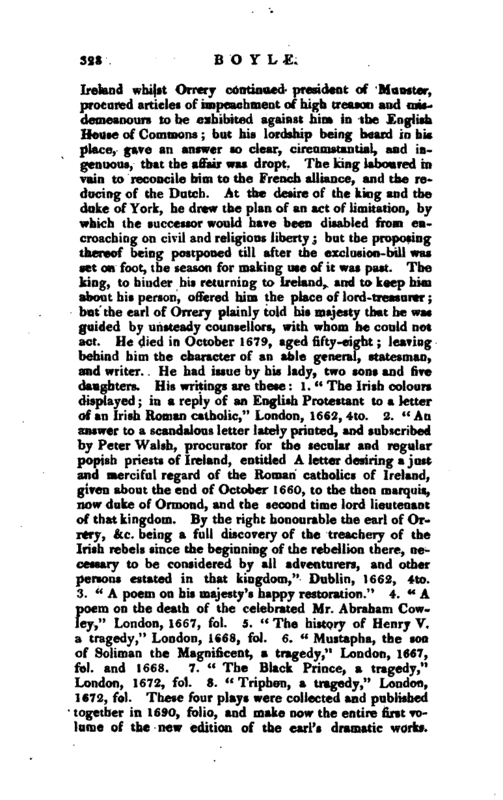 This last unexpected blow decided the dispute in favour of the Protestants; and obliged his majesty to dismiss the Irish commissioners with some harsher expressions than he commonly made use of. chief treasure, and only real strength, is the affections of his people. 11. “A treatise upon the Art of War.” 12. Poems on the Fasts and Festivals of the Church.“His posthumous works are: 1.” Mr. Anthony, a comedy,“1692. 2.” Guzman, a comedy,“1693. 3.” Herod the great, a tragedy,“1694. 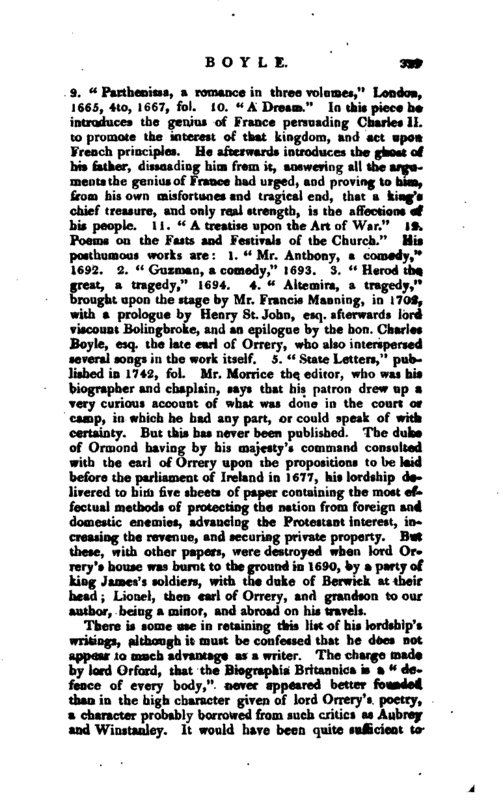 4.” Altemira, a tragedy,“brought upon the stage by Mr. Francis Manning, in 1702, with a prologue by Henry St. John, esq. 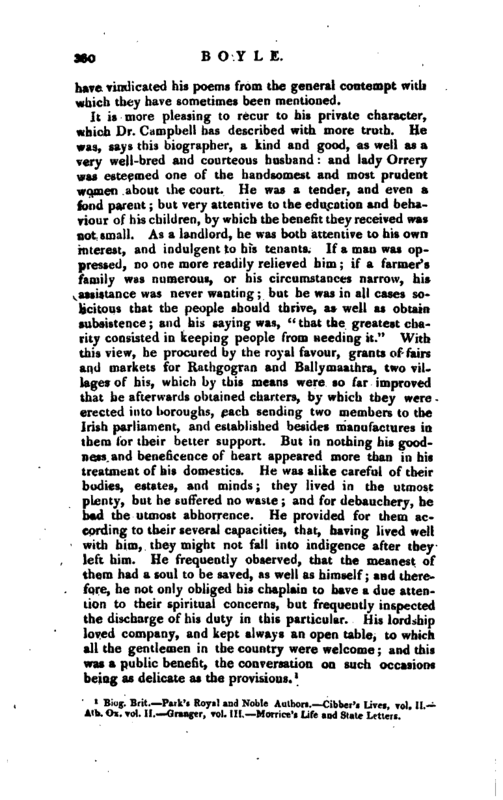 afterwards lord viscount Boiingbroke, and an epilogue by the hon. Charles Boyle, esq. the late earl of Orrery, who also interspersed several songs in the work itself. 5.” State letters," published in 1742, fol. Mr. Morrice the editor, who was his biographer and chaplain, says that his patron drew up a very curious account of what was done in the court or camp, in which he had any part, or could speak of with certainty. But this has never been published. The duke of Ormond having by his majesty’s command consulted with the earl of Orrery upon the propositions to be laid before the parliament of Ireland in 1677, his lordship delivered to him five sheets of paper containing the most effectual methods of protecting the nation from foreign and domestic enemies, advancing the Protestant interest, increasing the revenue, and securing private property. But these, with other papers, were destroyed when lord Orrery’s house was burnt to the ground in 1690, by a party of king James’s soldiers, with the duke of Berwick at their head; Lionel, then earl of Orrery, and grandson to our author, being a minor, and abroad on his travels. There is some use in retaining this list of his lordship’s writings, although it must be confessed that he does not appear to much advantage as a writer. The charge made by lord Orford, that the Biographia Britannica is a " defence of every body,’' never appeared better founded than in the high character given of lord Orrery’s poetry, a character probably borrowed from such cr.tics as Aubrey and Winstanley. Jt would have been quite | sufficient to have vindicated his poems from the general contempt with which they have sometimes been mentioned. Biog. Brit. Park’s Royal and Noble Authors. Cibber’s Lives, vol. II. —Ath. Ox. vol. II. Granger, To), ill. Maurice’s Life aud State Letters.